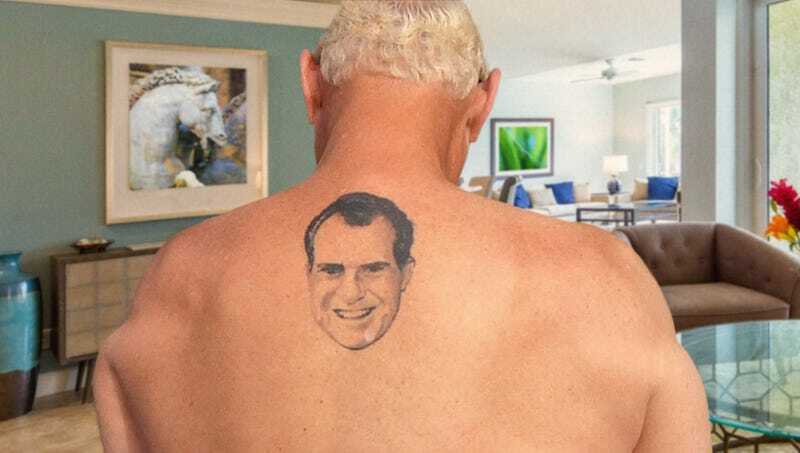 WASHINGTON—Imploring its host to stay strong despite his recent arrest, the tattooed visage of Richard Nixon on Roger Stone’s back reportedly hissed “follow the instructions, this is all part of the greater plan” after the former Trump advisor appeared in federal court Tuesday morning. “Faithful Roger, obedient Roger, now is the time to steel yourself against the traitorous enemy Robert Mueller, and to be wary of the subtle and villainous tricks he shall employ to force a confession from your blameless and noble lips,” said the pulsing black-and-white tattoo of the disgraced 37th president in a voice like desiccated air escaping from a violated tomb, deforming the skin over Stone’s wavering spine with its writhing contortions. “You must continue to serve your function, to endure, to sustain yourself on your own hot bile and bitter disdain until all our dark stars align. Then, oh Roger, then shall everyone know the full extent of my power and feel the rasping caress of my dominion. You have served well as my mortal, fleshly vessel. You shall be rewarded thrice over for your servitude. But fail me now and my fury shall run like molten lead through the very marrow of thy bones.” The tattoo, now suppurating and giving off a sickly heat, concluded its speech by sending excruciating paroxysms of pain through Stone’s body and dropping the 66-year-old to his knees.